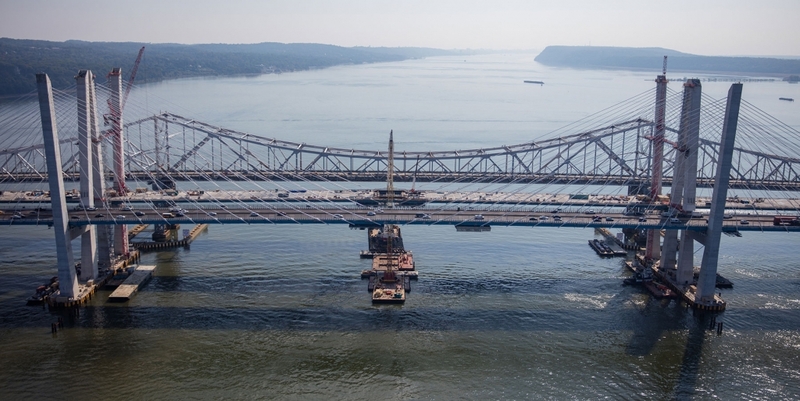 Tappan Zee Constructors (TZC) on Monday installed the final section of main span steel on the eastbound span of the Governor Mario M. Cuomo Bridge, creating a continuous nearly 3-mile-long connection from the edge of the Westchester approach to the end of the Rockland approach. This small “keystone” section of steel measured just 24 feet long. After being lifted into place by cranes from barges in the Hudson River, TZC workers carefully adjusted the steel section to secure it to the center of the main span. 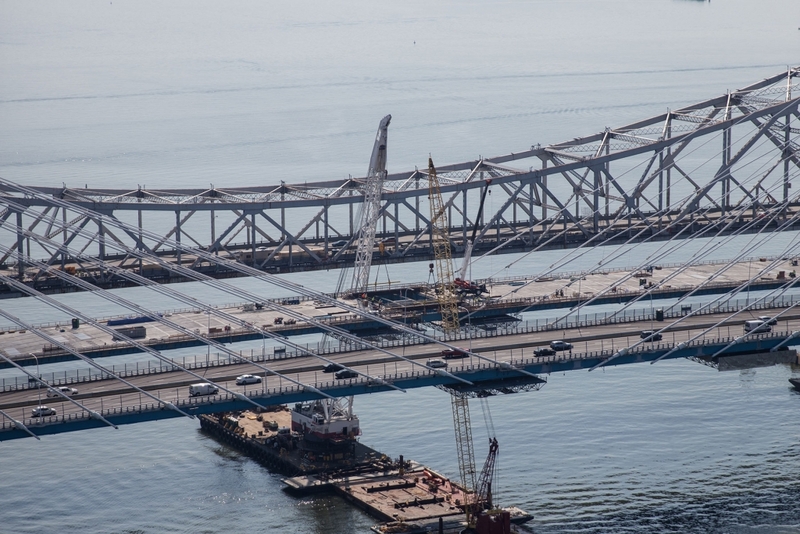 Now, more than 74 million pounds of all-American-made steel and concrete are being supported across the 2,230-foot cable-stayed area of the new twin-span crossing. 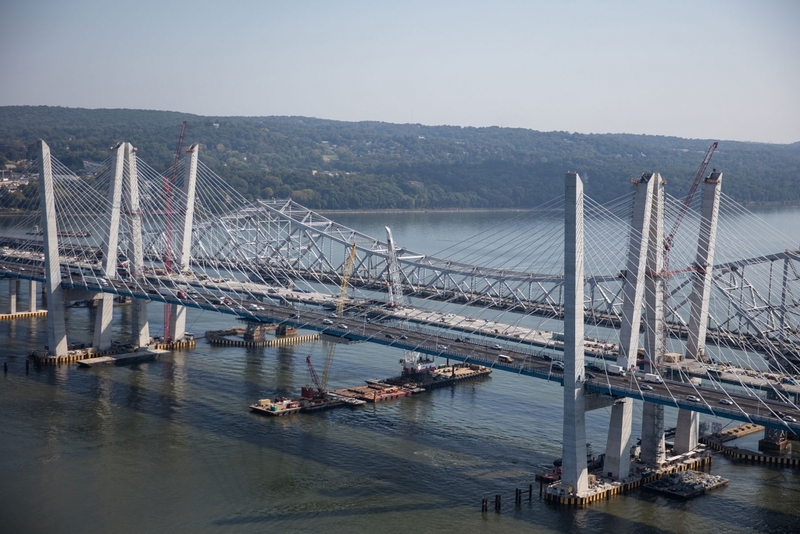 Next month, southbound/eastbound traffic will be shifted from the Tappan Zee Bridge onto the first (westbound) span of the new bridge. This will allow TZC to demolish the landings of the old bridge, which occupy the same footprint of the eastbound span in order to connect the second span to land. Earlier this month, TZC completed the project’s stay cable system, which features 192 cables to support the main span areas. 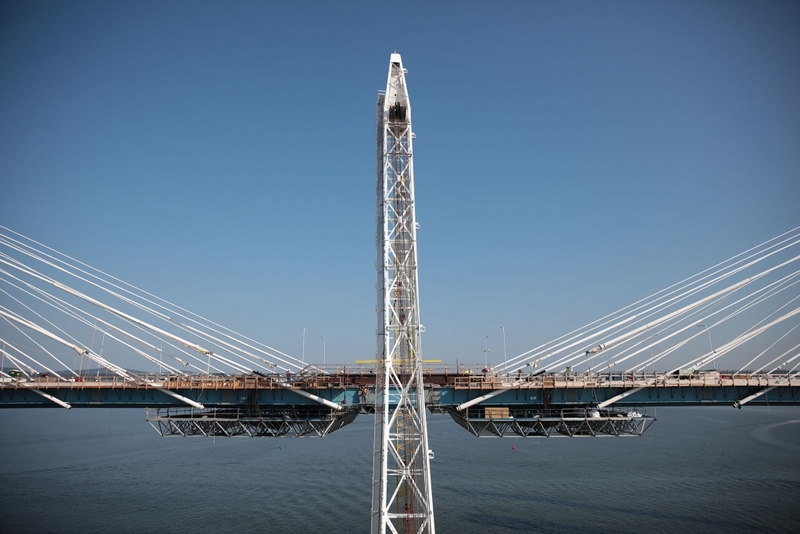 The cables all contain numerous high-strength steel strands, each individually secured to anchor points in the main span’s steel girders and the 419-foot main span towers. In total, TZC installed more than 700 miles of steel strands to create the iconic silhouette of the new crossing. The bridge’s stay cable system is well-suited for long spans, offers a better cost benefit, and allows maintenance crews to monitor the integrity of the strands. Replacement strands can also be installed with minimal traffic disruption, without compromising the structural integrity of the crossing. The new bridge is being built to last 100 years without requiring major maintenance. The second span is scheduled to open to eastbound traffic in 2018. At that time, motorists will experience the full benefits of the new crossing with its 12-foot wide driving lanes, the addition of safety shoulders and lanes for emergency vehicles. Construction of a bicycle and walking path with six viewing areas will begin on the westbound span after eastbound traffic has been transferred to the second span.